A rock – about like the one in the picture – features in one of the beloved stories of Universalist lore. It seems that back in the late-1700s, the great Universalist preacher John Murray was preaching the good news that a loving God would not condemn creatures of his own making to eternal damnation. This was a controversial thing to say, and Rev. Murray aroused resistance and hostility. LoraKim and I once had a rock argument ourselves. In the summer of 1999, about 13 years ago, LoraKim and I were dating. This was almost a year before we got married. She was between her second and third year of divinity school, and I hadn’t started divinity school yet. I was a lay leader in our Nashville, Tennessee congregation as well as the regular preacher at a little Fellowship up the road in Clarksville, Tennessee. That summer of ’99, I attended the week-long Leadership School at The Mountain. “The Mountain” (their website: click here), is a Unitarian Universalist retreat and learning center in the Appalachian Mountains in western North Carolina, about a 5 or 6 hour drive from Nashville. I was learning about Unitarian Universalist history, and worship, and how not to panic if you were to wake up one morning and discover that you were on a church governing board. The Mountain was a beautiful setting, out there, surrounded by the mountains and trees. Toward the end of the week, LoraKim dropped by The Mountain to visit for an afternoon on her way to visit her Mom in eastern North Carolina. I had some break time, so LoraKim and I went hiking about along the trails through the woods. We got to talking in that earnest and deep way that graduate students in humanities fields are prone to do. We had a philosophical disagreement that day that came close to being a fight. 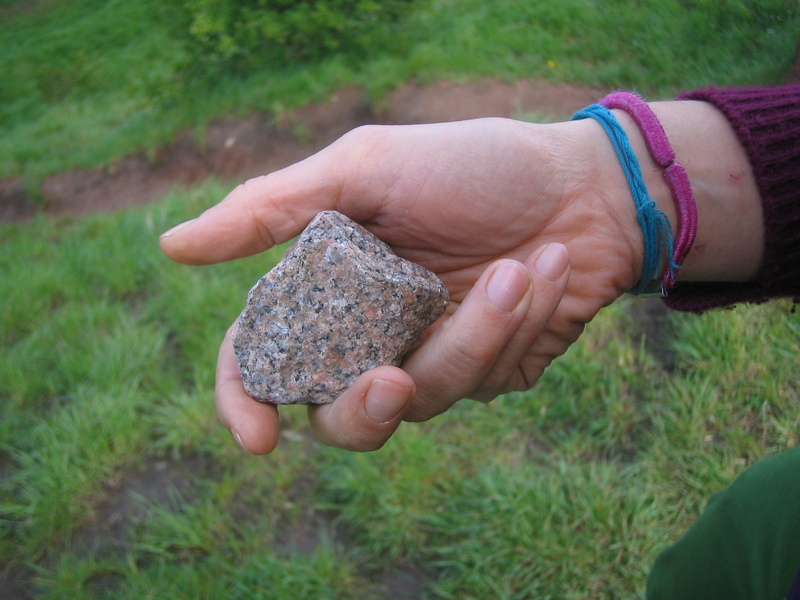 We had what may have been our first fight, and we had it about a rock just like the one in the picture. LoraKim was saying that legitimate care and concern extends to all things. "Well, not all things. Not this rock," I said, picking up one about the size that might have crashed through the window of John Murray’s church. "It doesn’t have a central nervous system; it doesn’t feel." Violence against a stuffed animal, she pointed out, enacts violence, cultivates violence in our hearts, and it does harm to us. We agreed about that. There’s harm to us, I agreed, one, from development of tendencies and habits which might then carry over to living creatures, and, two, there’s harm to ourselves and others from the loss of the value the stuffed animals has. But the stuffed animal in itself doesn’t feel harm. It might look like and remind us of something that can feel, but in itself, it’s like this rock. "We have no way to assess the question of whether a rock is benefited or harmed by being cracked in two," I said. "What we we have no way to assess," LoraKim said – snapped, almost -- "is how to draw a line where respect and caring stops." Part 1 of 5 of "Earth Justice, People Justice"
Next: Part 2: "Protecting the Life of Commerce"